A big man with a little blog. Hey there! Thanks for dropping by The Portly Shepherd to His Blog! Take a look around and grab the RSS feed to stay updated. See you around! In 2012, on a sunny February day, Ryan Braun stood before a collection of media outlets and gave a speech. Earlier, Braun had won an arbitration hearing that overturned a 50-game suspension he had received for violating MLB’s drug policy. Press conferences have become the societal norm in such situations. Braun’s handlers, and no doubt Braun himself, were going to use this opportunity to get in the last word on the matter and move forward. You can watch the whole press conference here. An athlete testing positive for performance enhancing drugs (PED) is not a shocking revelation. It happens frequently enough that the public outrage is little more than a scroll along the bottom of your television set on the major sports networks or an even briefer television segment. Braun’s case however was different. 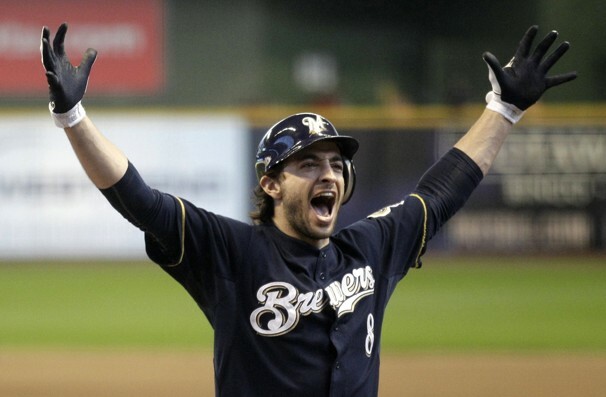 The Milwaukee Brewer’s outfielder won the 2011 National League MVP, beating out Los Angeles Dodger Matt Kemp. Winning such an award, when arguably Kemp was the better player during the 2011 season put Braun in the national spotlight and in the cross hairs. I do not think anyone put much stock into those word that spring. Some people believe the mind subconsciously lets out our most guarded secrets. Jesus did say, “out of the abundance of the heart the mouth speaketh” (Mat. 12:34). I am not sure if this applies specifically to Braun’s words or if I am merely being anachronistic with the information I now have at my finger tips. After all, I can think of no athlete in any of the major sports that would take a different approach to their profession. Winning is the reason they play the game. Winning is why franchise owners spend millions each year so that grown men can play games to the amusement of the masses. Whatever the truth of the matter, Braun’s elation at signing a new contract, winning an MVP award, and successfully fending off a 50-game suspension came crashing down into the miry clay of despondency last week. MLB handed down a 65-game suspension to Braun for violating the league’s Joint Drug Program. Sources report Braun negotiated the terms of his suspension with MLB executives and will not appeal. The number of games is significant because it means his 2013 season is over. The suspension is without pay, which means Braun will lose roughly $3.85 million. When compared with his potential earnings of $141.65 million throughout the life of his contract, this season’s loss appears insignificant. My point with this post is not to go over Braun’s financials, nor is it even to comment on the use of PEDs in professional sports. It is the reaction of Braun and those around him to the years of deception that has been at work. Braun’s previous suspension was overturned on a technicality. The technician handling the sample did not send it directly to a lab, but kept it refrigerated for a few days before sending it off to be tested. Despite his best attempts at moving beyond the controversy after the suspension was overturned by an arbiter, there was a lingering cloud over him. People were convinced, myself included, he was guilty of “juicing” and had gotten away with the crime. Braun’s own words at the press conference following his acquittal were, “We were able to get through this because I am innocent and the truth is on our side.” It took me some time to come to terms with the state of the American morality last week after all these revelations came to light. In the presence of the media with microphones and cameras rolling, Ryan Braun stood before those reporters and the American people, particularly the baseball fans of this country and lied. It was not a lie of ignorance that we all make from time to time (i.e. “I believe his name is George. Oh, it is Glenn, my mistake.”). It was a premeditated, scripted lie. Appearances on a Sean Bean meme spell disaster. Your career has the same chance of survival as Bean’s characters do in any movie. Fast forward a year and a half. The tune has changed, but there is still this lingering cloud of dishonesty that hangs over Ryan Braun and MLB in general. The PED issue is not dead in MLB and is perhaps taking on a new life with a current list of active players linked to Tony Bosch and his Biogenesis clinic. A bigger name and contract than Braun’s is at the top of everyone’s list in Alex Rodriguez, who has admitted to using PEDs in the past, but appears poised to fight the new accusations of impropriety. After the 65-game suspension was announced, Braun came forward with another statement. To me, it was no more contrite than his previous comments on the matter. He said, “As I have acknowledged in the past, I am not perfect. I realize NOW that I have made some mistakes. I am willing to accept the consequences of those actions” (emphasis mine). I have a few problems with this “apology” from Braun. First, Braun’s acknowledgement of his imperfection is irrelevant. He was not coming across as a saint to anyone. He was acquitted on a technicality from a previous suspension. While this feat is nothing short of miraculous legal maneuvering, it did nothing to endear Braun or his camp to the general public. I would dare say, outside of the Milwaukee fan base, Braun became an enemy to the state of baseball. Recognizing our imperfection is a good thing when it is done correctly and in the proper perspective of God’s Word (Rom. 3:10, 23). Braun’s admission read and sounded like an arrogant deflection of the real issue. This view is only supported by the eventual revelation of his PED use. Secondly, if I am to take Braun’s words at face value, he only came to the conclusion that his actions were wrong after being caught. There is nothing apologetic about such a statement. It implies that Braun’s previous, premeditated lying was done with a clear conscience. 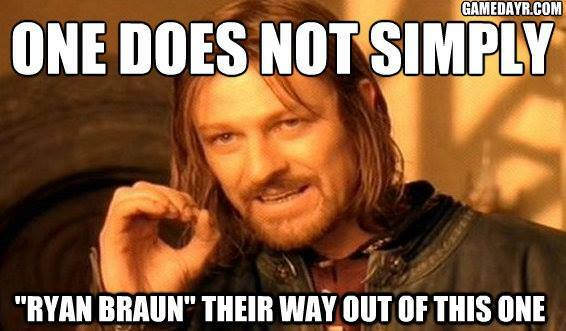 Only after exposure did Braun come to the conclusion that perhaps he was wrong! In essence, Braun is not apologizing for the multitude of lies and subterfuge he used to escape detection and sanction previously. No. He is apologizing that his deception and legal maneuvering backed him into a corner from which he could not escape. If an undetectable PED substance existed, I am confident Braun would use it without remorse. And last of all, the interesting aspect of consequences is they come whether we accept them or not. Braun’s willingness “accept” the consequences of his actions further solidifies his perceived arrogance in the face of this reputation-staining ordeal. MLB sets a dangerous precedent on the cusp of the Biogenesis controversy by negotiating the terms of Braun’s suspension with him. Plea deals are common occurrence in our judicial system; however, it does little to discourage future offenses, especially from morally blind players such as Braun. The Executive Director of the MLB Player’s Union, Michael Weiner, praised Braun saying, “I am deeply gratified to see Ryan taking this bold step.” What step has Braun taken that is worthy of praise. He lied to baseball executives in 2011, lied to his organization and fan base in Milwaukee, made a mockery of the arbitration process by contesting his first suspension while knowing he was guilty, and in the process of that arbitration Braun and his lawyers sullied the reputation of the courier that collected his tainted sample. It should also be noted that Weiner sat on the three person panel that overturned Braun’s previous suspension. This issue has struck such a cord with me for a few reasons. First, I am a true baseball fan. I love the game in all of its various incarnations from Little League to Major League. I have been a fan since childhood and feel as if I’m in a sporting limbo between late October when the season ends until the beginning of Spring Training in March. Yes, I like other sports as well, but nothing fascinates me like baseball. The first sign of Braun juicing was seen on this play in left field vs. the Blue Jays. Braun was standing on first base when he jumped. Braun and all the other players have marred the game with their selfish antics. I am not unsympathetic to those who come forward and confess their impropriety. I even believe these men should eventually take their place in the Baseball Hall of Fame. However, I am over the great deception from men such as Braun. I pray he one day becomes truly penitent for his actions and becomes more than he appears to be now, which is an unapologetic cheater. The second reason this is so troubling to me is that my son is at the age of imitation. He likes to imitate everything that I do from the words I say to the actions I perform. It is just a stage of life. One of our favorite things to do is watch baseball together. I can say it is difficult to watch the game with the deluge of questions coming my way, but I do get to see the wide-eyed wonder on my little boys face as he watches these professional athletes play baseball. These anti-PED policies are not in place to protect the professional athletes. They are in place to protect the teenagers and young men coming up through the various systems. When PEDs were previously free to use, though still secret from the majority of fans, their was rampant usage in all levels of the game. I personally know middle school athletes that were using PEDs in the early 1990’s while I was in school. The reasoning was for competitive advantage and that minuscule hope of hitting it big in a major sport. The ugly truth of PEDs were virtually unknown to many of us during my high school days. I never played organized sports seriously or even very long, so there was no allure for me to use PEDs. However, I understood why others did. Their hero, their idol used them and that was the only motivation needed. I know how easily hero worship can develop in a young mind, especially one with an overpowering cocktail of my genes running through his little body and mind. My son is not old enough to understand any of the details surrounding this case and I am confident he knows nothing about it. But, what do you say when your child does understand? How do you prepare your children for disappointment that will surely come as they look up to these so-called heroes? I cannot protect my children from every evil in this world, but I can prepare them to deal with it as Scripture commands. One of the greatest lessons we try to teach our children is honesty. The truth does hurt sometimes, but it is always, without exception, the best policy. Merely being honest for honesty’s sake would be difficult, and I do not believer virtue for only virtue’s sake is biblical. We teach honesty because God is truth (Deu. 32:4) and His law is truth (Psa. 117:2). Bound within the Godhead is absolute truth and when we strive for truth we are striving to bear the image from which we were created–God. Superstars will rise and fall in the world of Major League Baseball. Our era will no doubt see the rise of stars faster, stronger, better equipped, and more thoroughly trained than any of their predecessors. Long-standing records will be toppled and previously unheard of stats will be recorded for future generations. In the end, the records and statistics are nothing more than numbers. Sure, they lead us down memory lane and bring smile to our face as we remember the legendary player or an unforgettable game. Yet, what are numbers against the backdrop of eternity? Looking for a Specific Post Topic?